A designer salwar kameez is a combination of ethnicity and modernity. By giving the salwar suit design a western touch, the fashion designers have revamped the concept to a whole new and different level in terms of design while keeping the cultural and traditional point in mind. Today, Salwar suits ranging from casual, formal to party wear are easily accessible in boutiques. Salwar kameez is a must-have in any woman’s wardrobe for all occasions because of the embroidery, fabrics, the designs, and the patterns used. The lines are becoming blurred between modern Indian, western, and Indo-western dresses. Latest trends include crop tops, high-slit tops, off shoulder kameez and floor length Anarkali. The model in Indo-western designer salwar kameez. Indo-western suits combine western details like crop-tops, asymmetry, sheer with traditional elements like dhoti pants and palazzo pants. The model in Asymmetric designer salwar kameez. The asymmetric hem is on trend, flattering silhouettes. The kurta is longer at the back side and shorter in the front. It is often paired with a dupatta and Aladdin style pants or loose pants. Shraddha Kapoor in side slit Anarkali salwar suit. If you are looking for a traditional look with a cool twist, then side slits are a perfect choice. For the perfect classy look, you can pair them with silk embroidered pants. The model in off-shoulder designer suit. Off-shoulder tops can help you make a real statement. Three-quartered sleeves or full- loose off shoulder tops are usually matched with palazzo and loose Aladdin-style pants. These tops are the perfect option for party-goers. Drishti Dhami in front slit designer suit. Front slit top is undoubtedly an eye-catching fashion concept. For an even sexier look match it with silk pants or palazzos and take the slit above up to your ribs. The model in floor length designer suit with jacket. 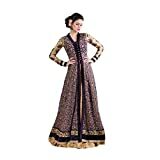 Royal Anarkali dress is matched with embroidery and long flared jacket. This beautiful combination is the perfect option for weddings and parties. The model with pre-drapped designer dupatta. For any girl looking for a fuss-free yet trendy outfit, a pre-draped dupatta is a perfect option as it is an excellent addition to your trousseau or party closet. This graceful dress offers a magnificent and royal look. 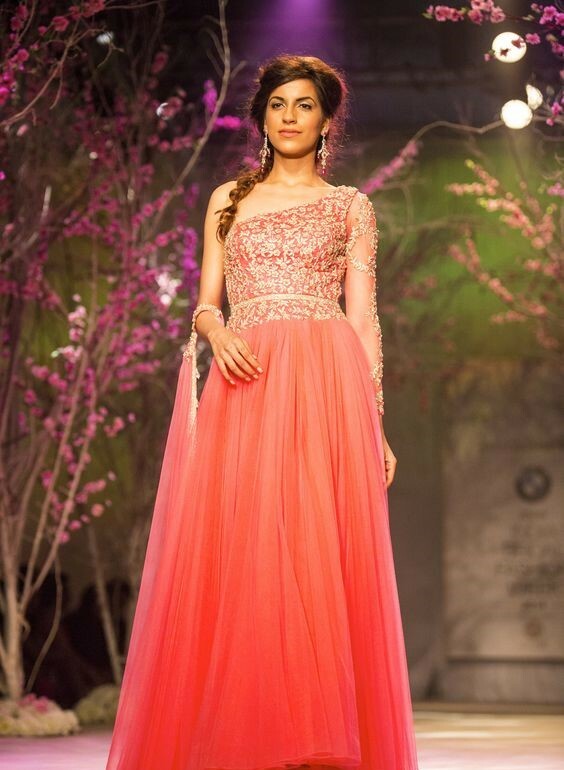 This is in trend for quite a while now, however, it’s still most favored choice for an Indian wedding and party wear. The model in high neck collar suit. With high neck and collar, the designers add a formal touch to the floor length suits. Palazzo and loose pants are back in fashion offering the churidar and salwar a break! Some neck design looks perfect on narrow shoulders and some on broad ones. Thus, it is very important to choose the neckline based on your shoulder shape. People with bulky or muscular shoulders should choose broad necklines. One with broad shoulders should avoid sweetheart, square, boat and wide V neckline as these designs would make their shoulder look broader. Choose U neck or deep V-neck to make your shoulder look less broad. Neck designs offer a boost to the appeal of the Designer Salwar Kameez. Check the fabric and your neck shape, before selecting the necklines. A woman’s personality looks more impressive when she wear a properly stitched dress with a beautiful neckline. Some of the most popular necklines on designer kameez are V-neck, high or collar, jewel, sweetheart, square and scoop necklines. You can select a simple or stylish design for your beautiful salwar kameez. The salwar kameez with collar neckline. Collar neckline is very popular in India and looks perfect on any woman. This design is all about the band type collar which enhances the overall beauty of any salwar kameez. The model in salwar kameez with scoop neckline. Scoop Neckline also looks perfect on any fabric and woman while offering a modern look. This design is neither too deep nor too high. It also very elegant and stylish look. The model in sweetheart neckline suit. Like V-neck, this neckline looks great with the half, full and three-quarter Kurti sleeves. Laces are usually applied on this neckline. Women with heavy bust should not choose this neckline. This neckline looks ideal on the teenage girls and younger women. Madhuri Dixit in V Neck Anarkali Salwar Kameez by Anita Dongre. Women with short neck should choose this neckline as it will make their neck look longer. It looks perfect on the heavily embroidered kameez. The model in round neckline suit. Round neck looks perfect on kameez with embroidery work around the neck as it enhances the elegance of the dress. However, taller women should avoid this design. 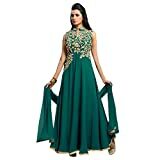 I hope the above-mentioned details about designer salwar kameez and neck designs help you in choosing the perfect salwaar kameez. Thank you for reading this article. Do subscribe for more updates.